It is advised to wear clothes that provide warmth as “onion” layers. And we have the quirkiest reason for that: Do you know that you tend to snack more when you're hungry? Layer up, stay fit. To avoid exposure to colds and viruses, you must keep your body warm, as well as your nose and ears warm. You must also avoid the sudden change in temperatures, and avoid closing the windows if you are in public places, to prevent the concentration of bacteria and viruses in your surroundings. There is no alternative to ventilating your room, because this is what renews the air you breathe. Try not to sleep in a bed that is exposed to a direct source of air. It is always better to place your bed at the interior walls of your room to keep warm during this season. Make sure to expose your body to sunlight; to maintain your serotonin levels and avoid mood swings and depression. Your skin faces dehydration in winter, which means it can crack dry and even bleed. You must constantly use moisturizers to keep it from drying and dulling. You should know that comfort and adequate sleep helps your body rejuvenate, and maintain its vitality. A well rested body has higher chances in fighting the increasingly dropping temperature. Cold weather should not prevent you from exercising. Instead, keep exercising regularly to strengthen your body, avoid excess weight, and depression. Don't let the rain stop your routine exercises, but make sure to get out for a run when the weather allows it. Try activating your body in any possible way: go for workouts in fitness clubs, get up and get down the stairs, stretch your body after business hours in the office. Exercising regularly also gets you in a great shape to fight the cold. 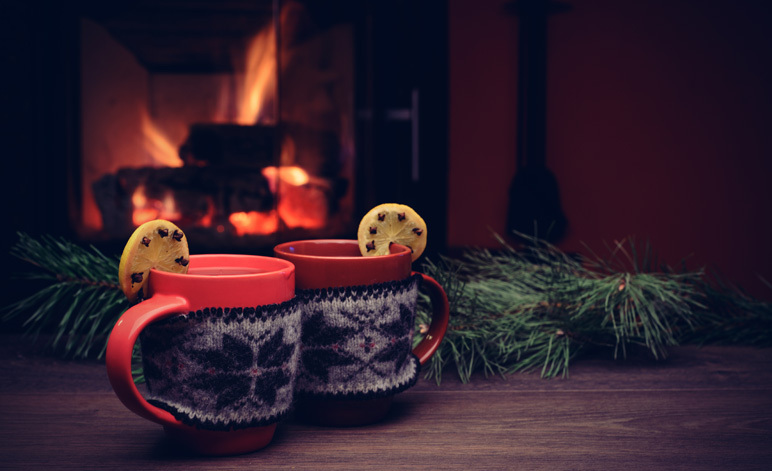 Hot drinks in cold times raise the body temperature, and provide it with energy. You can drink hot chocolate, or start the day by sipping something warm and nutritious. Make sure to start the day by drinking a warm drink, such as hot water with lemon or mint, because they help the body maintain its internal temperature, and help the blood flow. 70% of our bodies are made up of water. Your body needs water in winter as well, especially that your skin is double fighting he cold and dry weather. Make sure you're drinking enough water, and herbal teas. Make sure you're getting your vitamins and nutrients from the food you eat. Eat whole grains, vegetables, fruits, carbohydrates, and proteins, and drink hot soups because of their contribution to building the necessary antibiotics storage for your immune system. Do not drink your calories though, as this habit will deprive you of your basic need for fibers.